Ben shares some insight into the Klei world with FK. Klei is a collection of jewellery and ornamental vessels, our work is split 50/50 between production pieces and one off works. We have a clear aesthetic that is not trend driven, we’re drawn to a muted palette and organic forms. We try to make tactile pieces that look like they may have been left out in the elements and have become weathered over time. We both trained as dancers and worked in performing arts before starting Klei, neither of us had any formal design or ceramics training but we had a definite vision of what we were trying to do. We sought information from people in the field and lots of reference books. There has been lots of trial and error and we have built up a considerable archive of mistakes but the beauty of working in ceramics means unexpected results can take a piece in a new direction or even be the inspiration of a new line. What was the main inspiration to starting your label? The label started very organically, Barbara and I were still dancing and ceramics was something we both enjoyed on the side. Barbara made herself a porcelain ring and so many people asked her wear she bought it. Before long we were making rings on demand for friends and family and a local store placed an order and they sold out very quickly. We added new items to the range and within a couple of months had a collection. Up until this time we had never contemplated turning our hobby into a job. We had been making and selling our work for half a year before we came up with a name. In Dutch “klei” means clay and that is where Barbara and I met and started working with ceramics so it felt like a fitting name for our label. Where and what is your workspace like? Up until six months ago we worked out of a studio in our home. Everything slowly crept out of the garage and before long had taken over every surface in the house. Neither of us ever felt a need to separate work and home life, but it was getting silly when we realized we hadn’t eaten at the dining table for several months. Our new studio is a five minute walk from home and part of a large industrial complex. 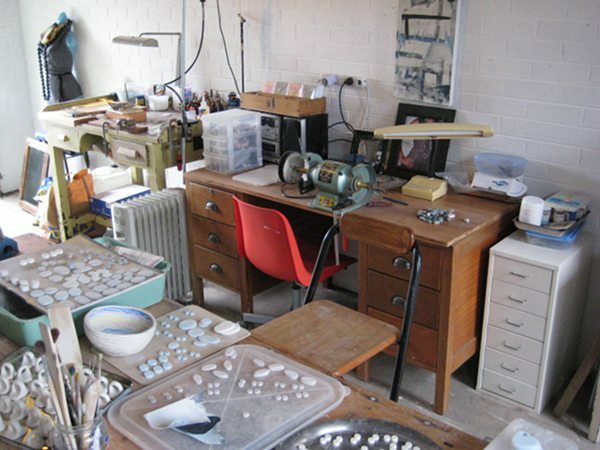 We feel spoilt for space as it accommodates our ceramic and silver studios, office and little showroom. 24 hr access and no neighbours to annoy is also a plus. We still bring work home but the rule is dirty work stays at the studio, no more soldering in the kitchen. What are you working on now & what are your plans for the future? Barbara is working on a series of hand built stoneware vessels, they are not at all functional, one stands 105 cm high. The colour is built up in many layers creating amazing textures, they have an arid landscape feel to them. I am experimenting with ways to fuse silver to unglazed porcelain and it’s not proving easy. We have also made a micro collection of clothing that consists of 5 pieces. It has been well received and we look forward to adding new items to the range. At the moment we feel like we are at a cross roads, we are caught between enjoying having total control over every aspect of our practice but being at maximum capacity in regards to the amount of product we can produce. Deciding whether to grow our business is proving more difficult than we thought, at the moment it is just the two of us in the studio and its very comfortable but to take on new opportunities we would need to get some help with various tasks. Klei is our baby so we are finding it hard to hand over jobs, even the boring ones, to other people. these are magnifcent,its always the self taught ones that seem to produce great work because they have’nt been trained out of their instincts.Love it.